This topic provides an overview of how to create an Audience-enabled Brightcove player. Note that Audience Tracking is provided by default. 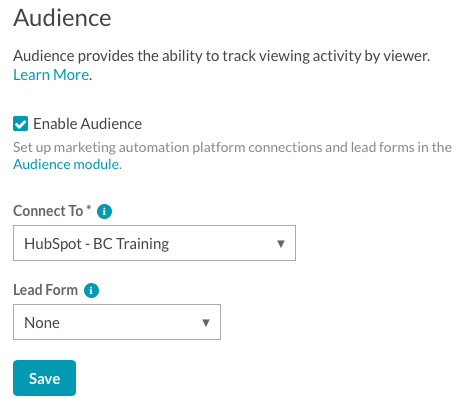 To create an Audience-enabled player using the Audience module, follow these steps. Click Create Player. A new Audience-enabled player will be created and appear in the list of players. Using the Connect To dropdown, select the data connection that the player will use. (Optional) Using the Lead Form dropdown, select the lead form that the player will use. To Audience-enable an existing player, follow these steps. Click on a player name to open the player properties. Click Audience in the left navigation menu. Check the Enable Audience option. Use the Connect To dropdown to select an Audience connection. (Optional) Use the Lead Form dropdown to select a lead form to use. Click Save. A message will appear indicating that you have unpublished changes. Click Publish & Embed and then Publish Changes to publish the change to the player. Return to the Audience module. Click Audience Players in the left navigation. Confirm that the player appears in the list of Audience players.